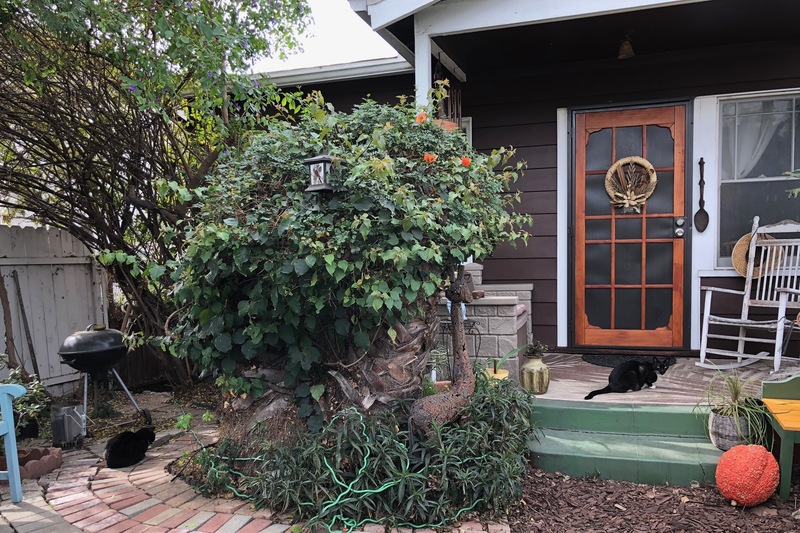 For the third time since this series started in October 2016, kitties living just outside the neighborhood boundaries participate. My wife and I met the first, nicknamed Chill, on Arizona Street—same as the two you see in the Featured Image. Texas separates University Heights from North Park, and Arizona is one street beyond. The other honorary furball, Sammy—and that’s her real name—lives across Washington Street in Hillcrest at DC Computers. Yep, she is the shop cat. Sometimes exceptions must be made, but rarely—why this is only the third among 131 postings. I found the cats and their (presumably) owner’s house too quaint to resist. That said, had the pair been another street beyond Texas, they wouldn’t make the cut. Lucky for them, too, that it’s the slowest sightings time of year. On Jan. 6, 2018, as Anne and I walked towards El Cajon Blvd. somewhere beyond Monroe Ave., I saw one of the two Buddies—my nickname for them—come up from around a car onto the sidewalk and into a yard. As we approached, I was surprised to find not one but two putty-tats. The second, to the left, never turned my way. I shot four quick portraits, using iPhone X; two include both cats, and this is the better of them. Vitals: f/1.8, ISO 25, 1/120 sec 4mm; 1:02 p.m. PST. The pic is a 3:2-cropped HDR composite. Previously featured felines: Scruffy, Roly Poly, Woo, Skull, Biscuit, The Colonel, White, Chipper, Frisky, Stretch, Needy, Farfisa, Mates, Hunter, Pee-Pee, Blue, Blue Too, Bonded Pair, Patience, Fess, Jumper, Frenemy, Looker, Cozy, Scout, Lurks, Skit, Mini, Betty, Black and White, Stalker, Bell, Chill, Sammy, Scratch, Poser, Star, Grey and White, Watcher, Herman, Comet, Roman, Willow, Chub, Nimbus, Watson, Lilo, Kit, Pepe, Twilight, Sebastian, Spot, Booger, Ash, Veruca, Riley, Mellow, Bonde, Flower, Glass, Black, BeBe, Fang, Bruce, Siamese, Pounce, Tortie, Haiku, Fraidy, Peso, Daniel Tiger, Dusk, Stride, Dainty, Spry,Tabby, Betty Too, Still, Levi, Shadow, Sophie, Wink, Ferals, Momma, Charlie, Tux, Cool, Benny, Jellicle, Itchy Valentino, Goldie, Nine, Amanda, Siesta, ChaCho, Charlie, Too, Mika, Crystal, Seeker, Mittens, Dancer, Smokey, Monkey, Captain Blackbeard, Season, Maven, Tink, Chunk, Curious, Hanoi, Bella, Tarry, Guido, Maxine, Mr. Kitty, Peohe, Panda, Frankie, Sunshine, Twain, Willow, Too, Brawn, Reddy, Burglar, Laramie, Lupe, Bright, Tom, and Charm.